When the British Army needed help last week, there was only one person who could answer the call, Northampton based cadet Summer Keightley. 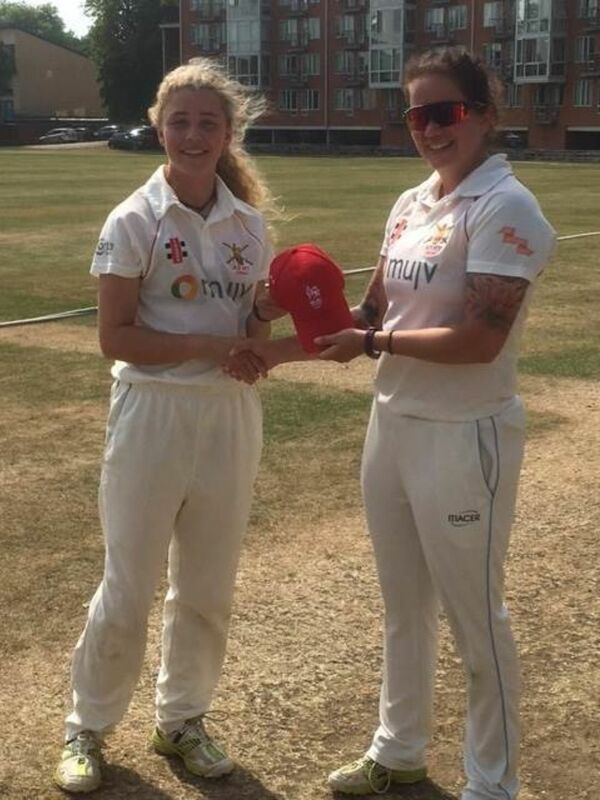 Summer, a Cadet Regimental Sergeant Major (RSM) in Leicestershire, Northamptonshire and Rutland Army Cadet Force was called to play in the first 11 for the Army Ladies Cricket team, the first ever army cadet to have worn the official army shirt and play at army level. Summer played a 40-over match against Cambridge University at Fenner's, the unversity's home ground. “We were delighted to field Cadet RSM Summer Keightley in the first 11," said Corporal Katie Fryer, captain of the British Army Ladies Cricket team. "Summer put the army shirt on with great pride and put in a sterling performance with bowling figures of 8-1-17-1, took a great catch at point and levelled her own personal best batting score of 21; it really was Summer's day for cricket." The team, coach, umpires and opposition were all impressed with Summer’s cricketing talent, Fryer said. "We were impressed with Summer not only because of her talent, but also the attitude and drive she showed together with her true army spirit. She integrated into the team within minutes, supported the newer players and when we had a batting collapse, Summer stood her ground and picked up the pieces with her all-round performance. In true army fashion, she led from the front." As a thank you, the team presented Summer with an army cricket team hat. "Summer truly is a credit to the Army Cadet Force system and showed that, even at 17, she can hold the standards and army spirit at the same level as current serving soldiers who have clocked many military years. We wish her all the best for the future and hope to see her play again before her time in the cadets is over," Fryer said. In addition to military-based subjects, the ACF offers opportunities for cadets to take part in many sporting activities at local, regional and national level; these include sports such as athletics, football, rugby, hockey and swimming.